As your all-inclusive dentists in Sedona and Cottonwood, AZ, we at Arizona Smile Designers are here to do all we can to give you a healthier mouth. To accomplish this goal, we offer a wide variety of beneficial dental treatments. One set of effective treatments that we offer is in periodontics, a branch of dentistry that’s dedicated with treating periodontal disease. Contrary to popular belief, tooth decay and gum disease aren’t inevitable signs of aging. You can actually maintain your teeth to last a lifetime and stave off periodontal disease. To do this, you’ll need to develop a good oral hygiene routine. Without it, you’ll almost certainly develop gingivitis, the first stage of gum disease. If that’s left untreated, the condition can progress into periodontal disease. 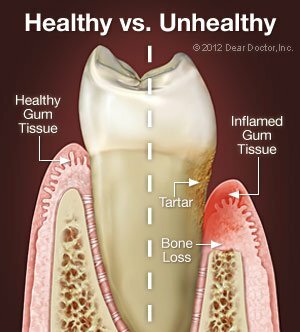 Periodontal disease can damage the gums, bone, and tissue around your teeth, eventually leading to tooth loss. What’s really problematic about periodontal disease is that it’s more than just an oral disease – it will affect your overall health as well. 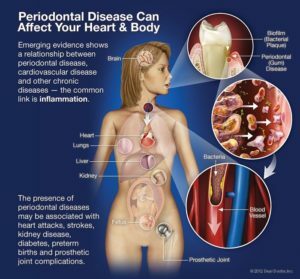 People with periodontal disease are more likely to develop heart disease, kidney disease, coronary artery disease, diabetes, and even some types of cancer. Thankfully, there’s a lot you can do to control it, even in its later stages. Bleeding Gums – This is one of the first signs of periodontal disease; a person shouldn’t assume that the bleeding is from brushing too hard. Red or Swollen Gums – Inflammation of the gums is another one of the main warning symptoms of periodontal disease. Bad Breath – Chronic bad breath can be a sign of lingering bacterial colonies in the mouth. Receding Gums – An early symptom of periodontal disease is that your gums start shrinking back and your teeth appear to be longer. Tooth Sensitivity – With the receding of gums, teeth may become increasingly sensitive to hot or cold foods and beverages. Abscesses – If bacteria get trapped in a periodontal pocket, it can fill with pus and form a painful abscess. Loose Teeth – When periodontitis advances and causes bone loss, teeth can separate from the bones and ligaments of the jaws, causing them to loosen. Scaling – This will remove tartar and bacteria from your tooth surfaces and also beneath your gums. Root Planing – This will smooth the root surfaces and discourage future buildup of bacteria and tartar. Antibiotics – These can help control bacterial infection. If your periodontitis is more advanced, we’ll likely perform dental surgery, which may include tissue grafts, bone grafting, or pocket reduction surgery. In many cases, we’ll use a combination of both types of procedures to get the best results for your oral health. Having said all that, the best thing to do is to not get periodontal disease in the first place! Thankfully, preventing gum disease isn’t terribly difficult. For most patients, all it will take is a strong oral hygiene regimen and regular visits to the dentist. Further suggestions we offer include eating a healthy diet, reducing stress, and stopping unhealthy habits like smoking. Contact Your Sedona and Cottonwood, AZ Periodontist Today! If you have any questions about periodontal disease or our periodontics, please don’t hesitate to contact us. If you’re interested in scheduling an appointment with our dentists, feel free to give us a call at (928) 634-8610. We’re looking forward to seeing you and putting you on the path toward a healthier smile! Contrary to popular belief, tooth decay isn’t an part of aging – you can actually maintain all of your teeth to last you a lifetime. One of the critical cornerstones to this is maintaining proper gum health and avoiding periodontal disease (gum disease). The tricky thing about gum disease, though, is that the signs and symptoms aren’t always apparent to you in the same way as they are to us. Good, daily oral hygiene habits are absolutely necessary for proper gum health – in fact, nearly all people who neglect their oral hygiene routine will develop gingivitis, the first stage of gum disease. If left untreated, the condition can progress into periodontitis, which can cause damage to the gums, tooth decay, and even bone loss around your teeth. Thankfully though, it’s fairly easy to prevent. While periodontal disease partly comes from genetics, there’s a lot you can do to fight and control it even in its later stages. Bleeding Gums: Some people take bloody gums as a sign that they’re brushing too hard – but make no mistake, while brushing too hard is certainly bad for gums, it should never cause bleeding. Any bleeding from gums should b taken as an indicator of periodontal disease, and we recommend calling us if you experience this. Halitosis: While bad breath from eating too much onion or garlic is normal, chronic bad breath can be a sign of lasting bacterial colonies in the mouth – colonies that attack the teeth and gums. Red or Swollen Gums: Inflammation is one of the first warning signs for gingivitis, so always be on the lookout for redness or swelling. Gum Recession: Teeth looking a little longer than normal? That’s not a sign that they’re growing – it’s likely that your gum tissue is receding, exposing tooth roots. This is a symptom of early periodontal disease. Tooth Sensitivity: This recession can cause teeth to be increasingly sensitive to hot or cold food and drink. Abscesses: If bacteria are trapped in a periodontal pocket, the pocket will fill with pus, forming a swollen, painful abscess. Loose Teeth: When advanced periodontitis causes bone loss, teeth can separate from the bones and ligaments of the jaws, causing them to loosen or migrate. Excessive force when biting or clenching and grinding can make this worse. The first step to periodontal therapy is evaluation of oral hygiene habits, where we’ll instruct you in proper oral hygiene habits for optimal gum health. After that, we’ll manually remove deposits of plaque and tartar that have formed on the tooth surfaces. Depending on the severity of the progression, we may also apply local antimicrobial products or antibiotics to help with healing and pocket-depth reduction. In severe cases, surgery may be needed to remove deep periodontal pockets between the gums and teeth. Many cases will require a combination of procedures to achieve ideal results. Periodontal disease is significant to not only your teeth, but to other parts of the body as well: it’s been linked to serious conditions like cardiovascular disease, diabetes, and pre-term births. While these links aren’t fully understood, research suggests it may have to do with the effect of periodontitis on systemic (full-body) inflammation. Bacterial strains commonly found in periodontal infections have also been found in the blood vessels of sufferers of cardiovascular disease, so it may be possible that these infections can travel out of the mouth and into the heart muscle. The moral of the story? Periodontal disease can harm a lot more than just your gums! Thankfully, preventing gum disease is relatively easy. For the vast majority of the patients, a strong oral hygiene regimen and regular dental cleanings are enough to keep the condition at bay. 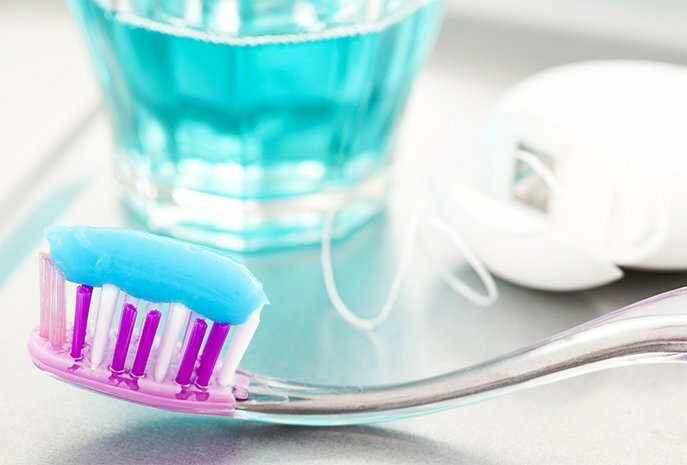 Be sure to brush and floss every day and come in for a cleaning at least every 6 months – this is the most important way to prevent periodontal disease on your own and to detect it if it does develop. Further steps include maintaining a healthy, balanced diet, reducing stress, and quitting unhealthy habits like smoking. Have more questions about gum disease or your orthodontic health in general? We’re here to help. Feel free to reach out to us at our contact page or use our easy online form to schedule an appointment at our Cottonwood, AZ office. We can’t wait to hear from you, and we look forward to working together to preserve your beautiful, healthy smile!